If you, like many, spent your lazy summer days playing with your iPad, you probably came across the work of Steve Varga and Dong Yoon Park. These two recent grads of the Parsons MFA Design and Technology program both launched iPad apps that they had developed as thesis projects, and immediately found an audience. Pennant, developed by Varga (graduated 2010), and Typography Insight, developed by Park (graduated 2011), were featured on the app store’s homepage as hot apps,, and the number of times each app has been downloaded has grown quickly since then. Varga received a 2011 Apple Design Award, which recognizes the year’s best-designed apps, in the student category. 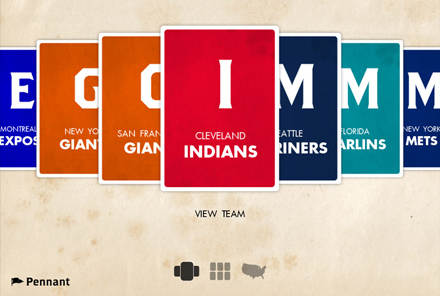 Pennant is an application that allows users to visualize the complete history of baseball through novel data interfaces. It has received praise from sports blogs and information designers alike. While the application was developed for the iPad, Varga is developing mobile versions for other devices. Also a thesis project, Typography Insight helps users, designers and newbies alike, understand the differences between common typefaces through a multi-touch interface that highlights the nuances of Garamond, Helvetica, Caslon and Baskerville, to name a few. Within weeks of its release, Typography Insight ranked as the second most downloaded paid app in the Education category. It has been named iPad App of the Week in U.S., Canadian, and Korean App Stores and was featured as a Staff Favorite/New and Noteworthy/What’s Hot, app in 89 countries. Park’s app has been covered by The Atlantic, Fast Company, and Gizmodo and was presented at the AIGA/NY Fresh Blood 2 event. Varga and Park are the two most recent examples of Parsons alumni who have found success bringing mobile apps to market. Alumnus Igor Pusenjak (graduated 2000; now a faculty member) created the blockbuster game Doodle Jump, which set mobile game sales records of over 5 million copies in its first year. In addition, the iPad application Halcyon, developed by alumni Zach Gage (2010) and Kurt Bieg (2011), was a finalist at the 2010 Independent Games Festival.